Is Assad the Author of ISIS? Did Iran Blow Up Assef Shawkat? 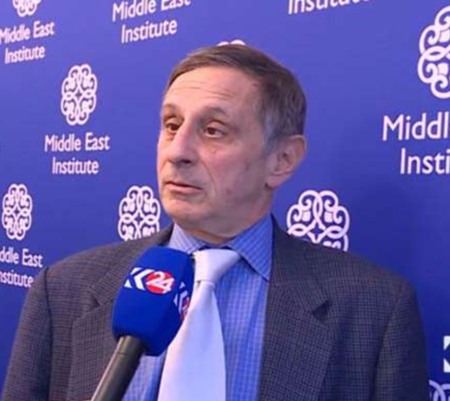 The article is based on testimonies from what Mr. Gutman refers to as political activists, defectors, Islamists from Hama province, former State officials and diplomats (asking for political asylum in the U.S), and former head of the Syrian Opposition coalition. 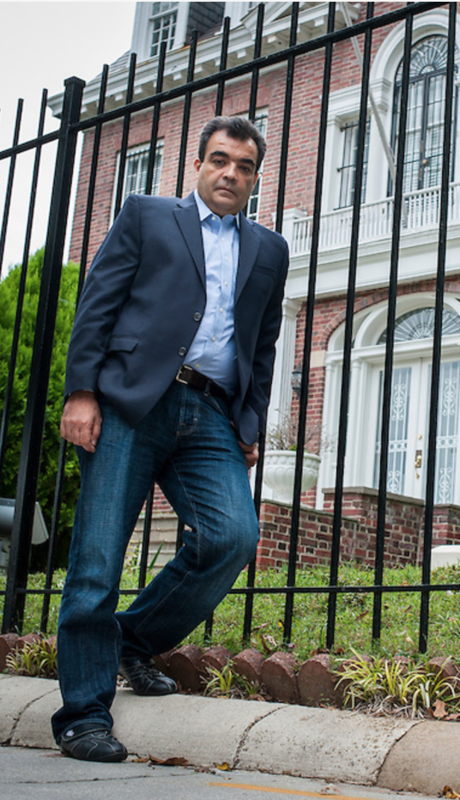 Bassam Barabandi, a former employee of the now closed Syrian Embassy in Washington, DC. One key source whose name seems to appear often throughout the article is Bassam Barabandi. Mr. Barabandi is a 41 year-old ex-diplomat who worked at the Syrian Embassy in Washington. He defected to the opposition after he used his position as a consular officer to issue Syrian passports to a number of opposition figures whose travel documents had expired. Back in 2014, he wrote an article for the Atlanic Council, entitiled “Inside Assad’s Playbook: Time and Terror with Tyler Jess Thompson who is a director at United for a Free Syria. This was an early attempt to link President Assad to Islamist terror groups. Had Mr. Gutman known anything about Syria, he would have been more suspicious of Mr. Barabandi based on a preposterous single claim he makes in the article. Supposedly, during a visit from Iraqi Prime Minister Nouri al Maliki, Mr. Barabandi remembers being huddled with Deputy Vice President Mohammad Nasif and “taking notes, monitoring interactions, disrupting conversations and altering room dynamics.” Mr. Barabandi quickly concludes that “no detail is too small for the Assad regime to overlook. There is always a plan, opportunities are never missed, and there are no accidents: the rise of ISIS is no exception to this rule.” Barabandi’s story about sitting in the Four Season’s Hotel with Syria’s Deputy Vice President is unbelievable for several reasons. The most obvious is that Nassif, an elderly man and top security chieftain would not be hanging out with Barabandi, a young 30 something civil servant who had yet to take up a post of any consequence. Moreover, Nassif would certainly not explain to him the inner-most secrets of the regime, nor demonstrate to him how the secret service operates behind one-way mirrors to manipulate foreign dignitaries. This account is absurd. When reading this article, one is reminded of Frontline’s Martin Smith when he confronted Ahmad Chalabi in Baghdad following the U.S invasion. Smith challenged Chalabi to provide the evidence of that he had promised existed to prove the existence of chemical weapons and Saddam’s links to Al-Qaida. Chalabi simply looked at Martin Smith with consummate distain and brushed off his nagging with the suggestion that such details were no longer important. He simply stated, “We are in Baghdad now.” For Chalabi, any number of fabrications were well worth the result. Saddam was destroyed and America had returned Iraq’s opposition to Baghdad where they could hope to take power. Chalabi’s smug dismissal of Martin Smith was well warranted because the date was 2003, before the Iraq insurgency had been able to organize, before al-Qaida had spread from one end of Iraq to the other, and before hundreds of thousands of innocent Iraqis had been killed and millions more driven from their country. Gutman relates that one opposition source explained that President Bashar al-Assad himself issued an order to remove roadblocks in Damascus so that a car bomber, claiming to be Nusra, could have easy access to a Damascus neighborhood, set off his huge explosion and make it look like the capital was being attacked by jihadists. This explosion was a false flag operation, Gutman argues, masterminded by Assad himself in order to deceive the world into believing that jihadists were a menace when they were not. Never mind that James Clapper, the director of U.S. National Intelligence, told Congress in mid-February that the explosions “had all the earmarks of an al Qaeda-like attack and so we believe al Qaeda in Iraq is extending its reach into Syria.” Never mind that Abu Muhammad al-Jawlani, the head of al-Qaida’s surrogate in Syria, the al-Nusra terrorist group, claimed responsibility for the explosion. Gutman insists that his source is telling the truth and everyone else, including the intelligence services of the United States are deceived by Assad propaganda. Why would U.S. news services publish these assertions? They make no sense. They reek of conspiracy theory, are transparently self-serving, and defy logic. Mr. Gutman’s sources are convinced that Iran, Syria’s closest ally, ordered the killing of Assad’s top security team. Not only do they speculate on who was behind the Damascus explosions, but they also attempt to deconstruct one of the most spectacular bombings that struck the inner circle of the Syrian leadership. On 18 July 2012 Assad’s Crisis Management Group was meeting at the heavily guarded National Security building in Rawda Square in central Damascus. 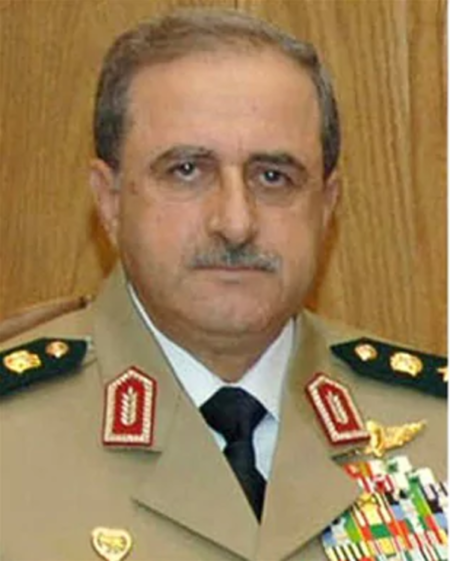 Those killed included top members of Assad’s Crisis Group: Defense Minister Gen. Dawoud Rajha, his deputy, Assaf Shawkat, who was Assad’s brother-in-law, Major General Hisham Ikhtiyar, a top national security adviser to the president, and Gen. Hassan Turkmani, a former defense minister. Gutman explains that Syrian Interior Minister Shaar placed a brief case against the wall in the room in order to blow up the security group. None of this makes sense, of course. Mr. Shaar stayed in the building, rather than escape. He blew himself up, severely injuring himself in the blast. He spent almost 40 days at Chami hospital in intensive care. If this is not crazy enough, Mr. Gutman offers an even more preposterous story to explain why Iran would blow up its ally’s leading security chieftains. Gutman, once again quoting sources “within Assad’s entourage” insists that Iran killed Shawkat, the President’s relative, in order to place their own man, Ali Mamlouk, as the head of intelligence. All of this is preposterous. It includes stories about Assad’s mother and brother, who are part of this great plot. They are intimately involved in this family intrigue. 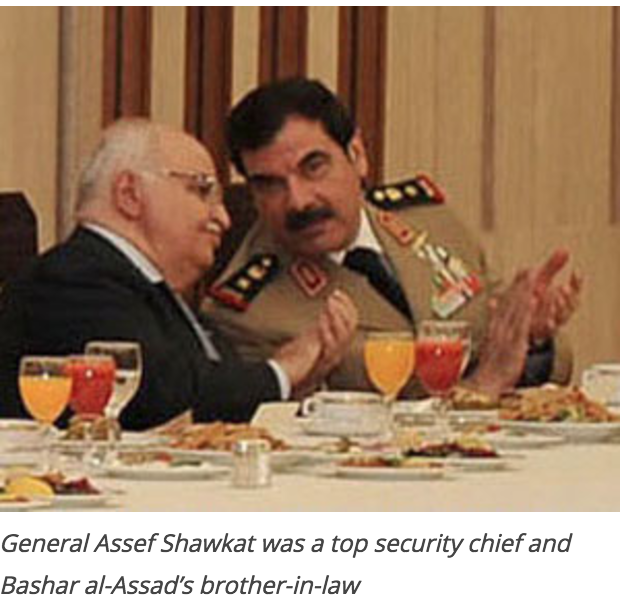 How could Gutman’s low level defectors possibly know the details of this Assad family saga? The simple answer, of course, is they couldn’t. Gutman repeatedly expresses outrage and consternation at the perfidy and incompetence of the CIA for not debriefing his Syrian opposition contacts to find out the deepest secrets of the Assad regime that he has found out. The Daily Beast, which publishes Gutman’s revelations, shares his outrage. Little wonder that so many Americans are having a hard time figuring out how to evaluate the “post-truth” age, when their news organs feed them such pablum. How in the world could Iran, Assad and Hizbollah be winning this regional war against Turkey, the Gulf States, Israel and a large array of Sunni rebel militias if Iran were blowing up the leadership of its closest ally? Certainly, it is comforting to believe that one’s enemies are incompetent, malevolent killers, but could they really have maintained a thirty-five year alliance if they were busy killing off family members and security chieftains of each other? These sorts of explanations for what is happening in Syria beggar belief. Such conspiracy theories are attractive in the absence of facts. Here is what I can reconstruct from a few sources who in a position to know. The only truth that Mr. Gutman’s sources told was that no one was “allowed to get close” to the investigation after the bombing. As we will see below, this would become an important factor in confirming the identity of the real perpetrators of the bombing. The crisis group regularly assembled at the office of the National Security inside the Qiyade Qutriye (Central Command building) and not at Turkmani’s office as Mr. Gutman’s article posits. Nearly 3 months before the July 18th bombing, an insider placed Mercury Cyanide inside the lentil soup that was offered to members of the crisis group. The poison almost killed Interior Minister Shaar and Turkmani. Asef Shawkat declined the soup dish and was not harmed. Following the incident, a decision was made to heighten security by regularly changing the meeting location. The offices of Hisham Ihtiyar and the Defense Minister became alternative venues for the meeting. Nearly 7 months after the bombing, European diplomats, the identity of whom I have been asked not to disclose, called a meeting between a Syrian official and an opposition figure who insisted that he had been behind the assassination of Assef Shawkat. The reason that the European diplomats called for the meeting was to pressure President Assad and his generals to resign. They believed that the success of the opposition figure in assassinating so many top government officials would intimidate Assad and convince him to leave Syria. 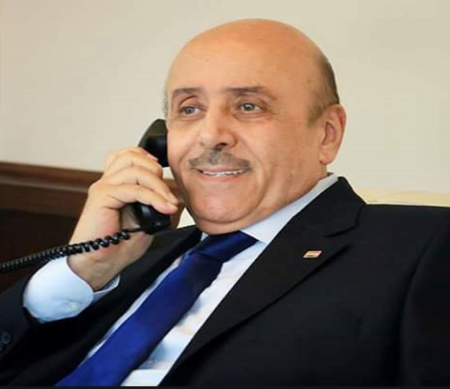 The opposition figure asked the Syrian official with whom he was meeting to relay to President Assad and his men that the opposition could assassinate him as surely as it has assassinated Assef Shawkat and the other principals of the regime. financier, had been involved in the bombing that killed the President’s brother-in-law. He went on to explain how Saudi Arabian officials had promised him a large sum of money that he later collected once the bombing had been successfully carried out. This was further confirmed when he described how he was able to recruit an Armenian officer who worked at Major General Hisham Ikhtiyar’s office to smuggle the explosives inside the building and use the adjacent office from which he was able to insert the bombs into the ceiling and have them placed into Mr. Ikhtiyar’s office, directly above the table around which the group convened. Fifteen minutes before the explosion, the Armenian officer left the building, claiming that he had to empty the garbage. He never returned. He had placed a timer in his office that triggered the explosion. He has never been seen again. His reward was $2 million out of the total of $7 million that was paid to the group. In 2012, barely a year into the Syrian crisis, the idea that the Syrian state might be the next government to fall in the Arab Spring was gaining momentum. With the probability of state collapse on the rise, it made sense for an Armenian officer and others like him to accept a $2 million payment in the hope starting a new life overseas. Recall that officials from a European capital witnessed the meeting in which the Syrian financier explained to Syrian officials how he had executed the assassination of Asef Shawkat. They can confirm this entire account. Contrary to the speculations of Mr. Gutman’s sources, Iran was not involved in the bombing. The regime was not turning on itself. Assad’s closest ally was not assassinating Assad family members in order to gain control over Syria. Almost immediately after 9/11, Assad authorized his intelligence services to share many of their files on the activities of the Muslim Brotherhood in Syria and Europe. Late in 2002, Syrian intelligence helped disrupt an attack by al-Qaida on the headquarters of the US Navy’s Fifth Fleet in Bahrain. Assad then also agreed to house suspected terrorists for the CIA in Syrian prisons. This developing collaboration between Damascus and Washington based on having al-Qaida as a common enemy was soon to go cold after Assad begun to publicly oppose the Iraq war. George W. Bush soon responded by linking Syria to an ‘axis of evil’ containing Iraq, Iran and North Korea. With the Iraq invasion gathering force, both the Syrian leadership and their Islamist enemies started to plan for the possibility that Damascus could be next after Iraq. The Syrian Islamist militants started to move to the north east of the country ahead of the American invasion of Iraq. They planned to fill the void should the Syrian state become the next target of the U.S. The Syrian state was becoming equally convinced of the American plans towards Syria. It was the head of one of the Intelligence agencies who soon saw an opportunity in infiltrating those Islamists moving to the border and then organizing them to move into Iraq rather than wait for the Americans to cross into Syria. This plan meant that those who cross into Iraq to fight are known to Syrian intelligence when they cross back into Syria. It was through this system that Syrian prisons saw a nearly 10 fold increase in jihadist ranks. These hardened fighters were to spread their ideology throughout an overcrowded and largely mismanaged Syrian prison system infecting the minds of many none jihadist Syrians in the process. Since fighting an earlier war with the Moslem Brotherhood in the early 1980’s, Syrian jails have been home to many Islamists. Syrian security agencies have traditionally trumped the Syrian justice system when it comes to the final say on the length of stay of those arrested. Often, when the justice system sentenced a person, the security services had the authority to ignore the end of the sentence by invoking “national security” concerns. This meant that many of those in prison were there beyond their legal stay. Scores of families never got to see their loved ones even after their original legal sentences were over. As the events in Daraa unfolded, the President invited key figures from the town to see what can be done to calm the demonstrations. One such figure was cleric Sayasneh. One of the consistent demands of such meetings was the release of prisoners. It was no different when Douma joined the uprising. Foreign Embassies were also pushing the Syrian State to release what it called political prisoners. 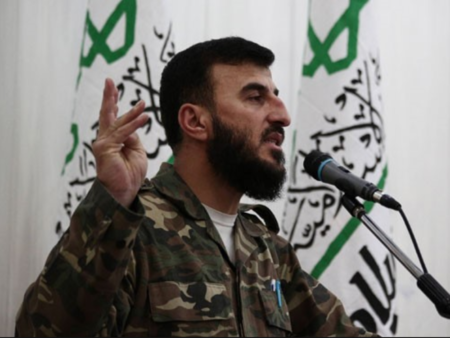 People like Zahran Alloush were sentenced to seven years in prison when he was arrested with a group of 40 people on the charge of promoting Wahhabi ideology and gun possession. They had not killed anyone or even fired a shot. Yet, they were sent to prisons like Sednaya and kept there beyond the end of their sentence on the whim of one of the security agencies. It was in this context when the residents of Douma demanded the release of prisoners from their districts. The Syrian leadership was under intense pressure to calm the crisis. The people of Douma promised to do their job at calming their own streets if some of those prisoners were released. Zahran and many others like him were released under this rationale. This is not too dissimilar to the way the American prisons in Iraq worked. Zarqawi, Baghdadi and Golani were all released from those prisons either when their terms ended or when the local populations demanded their release. Just like in Syrian prisons, the prisoners in American jails were also indoctrinated with jihadist ideology. Syria erred by releasing Alloush and Abboud who would go on to form Jeish al Islam and Ahrar just like the U.S. erred when it released Baghdadi who would go on to form ISIS. One of the longest standoffs between the Syrian Army and armed groups was at the Aleppo prison complex. Nearly 3,000 inmates and 500 Syrian police and soldiers were trapped inside the prison for close to 3 years by armed militias that regularly shelled it. Like so many similar regime-opposition standoffs, intense negotiations were regularly attempted between the two sides. Mr. Fedaa Majzoub, an Australian citizen, was the point man in the negotiations between the two sides. One of the key demands of al-Nusra and Ahrar al Sham, the two militias that led the seige of the Aleppo prison, was the release of 80 jihadist comrades that were amongst the 3000 inmates. 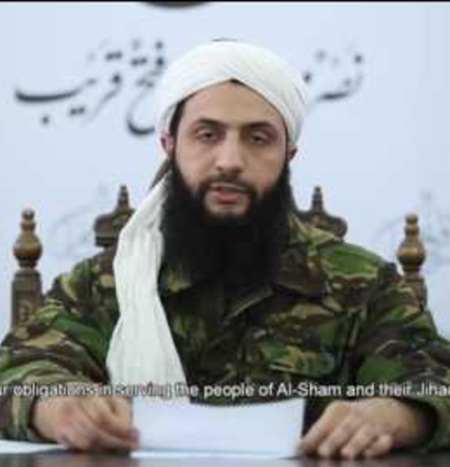 Had Damascus been following a strategy of releasing jihadists from Al Qaeda and the like onto Syrian streets to change the image of the uprising as suggested by the sources of Mr. Gutman’s article, there was never a better opportunity to do so by Assad. Instead of yielding to the demands of the negotiator to release the 80 jihadists, the Syrian leadership chose instead to defend the complex for resulting in a standoff that lasted nearly three years. Almost since the start of the Syrian crisis, the debate on the timing of the radicalization of the conflict still rages on. Supporters of the Syrian opposition refer to articles like Mr. Gutman’s to portray a peaceful uprising that Damascus desperately tried to radicalize through all means possible. Such sinister attempts were thought to include colluding with terrorists and releasing from their jails as well as bombing its own capital to prove a point. Loyalists and leadership insiders, on the other hand, believe that the uprising was radicalized very early on after the initial events were quickly hijacked by Islamists who had sat waiting for decades for this moment to start. Based on extensive personal conversations with ex White House officials, there seems to be a consensus that the defining moment of this debate was the incident that occurred at the town of Jisr al –Shugour in June of 2011. This is when 120 soldiers were killed between 3 and 6 June. Opposition activists say it was one part of the army firing on another for refusing to kill protesters. Thousands of miles away in Washington, American officials were already eavesdropping on Syrian opposition and others. On Friday June 3rd, White House officials knew that those soldiers were shot and killed by the opposition as the latter used various communication devices to boast about the incident. One particular official became convinced that the response of Damascus will be swift and devastating. He therefore decided to be at his desk over the weekend to monitor the situation. The weekend passed with no such response by Damascus. By Monday, officials at the White House were pleasantly surprised. Their worst fears of a harsh crackdown were never materialized. Over the coming weeks and months those early thoughts turned to be wishful thinking as Syria soon descended into its black tunnel. About Wahhabi influence in Syria, I remember hearing of villages around Zabadani where Saudis had bought properties which they would have been using as djihadist camps in the years 2003-2006 (to send fighters to Iraq). Anything on that? Now that we know Bassam Barabandi is following the footsteps of Ahmad Chalabi, can we get from Roy Gutman the names of his sources the likes of “Curveball” aka Rafid Ahmed Alwan Al-Janabi. Disinformation going to the max, where anything goes, until you get caught, if you do so. Considering the audience, most of whom have attention spans that only go so far as to read the headlines, then professing to be an expert on the subject. How low they have sunk, yet are praised. I personally do not buy the first story about the regime killing its own crisis group. But the second story about Assad’s role in creating ISIS is factual. It is a fact that Assad’s security services assisted the jihadis to assemble, train and cross to Iraq after the 2003 invasion. He used them to push the Americans back so they won’t come in to Syria. He used them to disturbe the order in Lebanon. And at the beginning of the Syrian uprising, he used them to discredit the genuine uprising. There is no doubt that the islamists started moving inside Syria soon after the uprising started, but Assad’s people knew that and instead of going after them, they focused their energy on the civil leadership such as Matar, Khayyer, Kashoush, etc. Once the genuine civil leadership was all gone, what’s left of the opposition leaders were either the Islamists or the exiled – both can be easily discredited through accusations of corruption, serving foreign agendas, or radicalism. The Assad regime, like the Jordanian regime and various U.S. administrations amongst others, has certainly manipulated and used Islamists when it was politically expedient, but claiming that Assad had a hand in creating ISIS is ludicrous. There is no credible evidence to support this assertion. Sure, Assad used Wahhabis in Lebanon, esp to help Hizballah, yeah. And I have a nice bridge in Lebanon to sell, too. Story A. is outlandish. Story B. only slightly less so. I am also curious about the reference to an Armenian officer in the Syrian military/security services. I am especially curious about one detail: to my knowledge, while Armenian Syrians fulfill their obligations to conscription, they generally do not establish careers in the armed forces, security or for that matter, the public sector in general. An Armenian officer? Is it likely that someone would put his family and community in jeopardy? The word was not edited out. You are right. He was not an officer but was serving his regular military service. The organization scheme of IS is rather based on their training by the former Stasi. Sadly it was very efficient. I believe that now that many Syrians have seen what is the reality of living in Europe they will realize that it was not the worse country on earth. That’s probably the problem of every close society/regime that people are totally delusional.